Rory McIlroy is a member of both the European and PGA Tours. After a week off following his Open victory in 2014, McIlroy won his first World Golf Championship event at the WGC-Bridgestone Invitational at Firestone and returned to world number one. Starting the final day three shots behind Sergio García, McIlroy shot a 66 to finish on 15 under par and two strokes clear. The following week, he won the PGA Championship at Valhalla for his fourth major, one shot ahead of runner-up Phil Mickelson. He has been cited as the most exciting young prospect in golf and as having the potential to become one of the highest earners in sports in terms of endorsements. 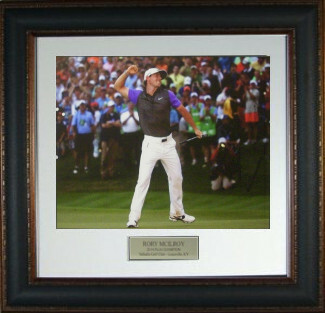 This is a Rory McIlory 16x20 Photo from the 2014 PGA @ Valhalla with Custom Matting and Premium Leather Framing.